As part of its activities to enhance the cooperation between the University and industrial partners, a delegation of GJU visited the facilities of the Jordan Airmotive Company (JALCo) located in Al-Qastal at the outskirts of Amman on 30.11.2016. The visit was initiated by Dr. Anas Atieh from the Industrial Engineering department who already successfully completed different applied research and graduation projects at JALCo's facilities. Also Dr. Aladdin Al-Halhouli, Dean of the School of Applied Technical Science and Britta Kähler, Director of the Office for Industrial Links, were welcomed by JALCo's CEO, Mr. Salam Kayali and some team members from the Planning and Production units and the HR department. Jordan Airmotive is one of the leading airplane engine maintenance, repair and overhaul companies in the Middle East. 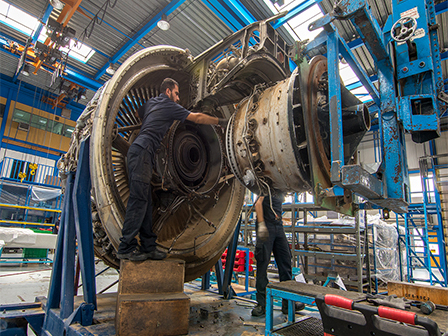 It's state of the art facilities provide latest technology to maintain different types of airplane engines and to serve the aviation/aerospace commercial industry. The representatives from GJU took a tour in the maintenance, overhaul, alteration and testing facilities and were introduced to the wide range of services JALCo offers its international clients. In addition, different cooperation opportunities were discussed, like common research and graduation projects, internship and job opportunities for students as well as the development of a Diploma program for different specializations needed in the aviation industry. Mr. Kayali invited GJU faculty members to use JALCo’s machines for research and training purposes and on the other hand is very keen to introduce new technologies and latest research results from the University to his company. Both parties are convinced about the win-win situation of such cooperation and are looking forward to establish a sustainable framework of mutual collaboration.